The lecture is presented by the Australian Association of Social Workers, the UWA Institute of Advanced Studies and the Department of Communities Western Australia. The 2018 Grace Vaughan Memorial Lecture by June Oscar AO, Aboriginal and Torres Strait Islander Social Justice Commissioner. 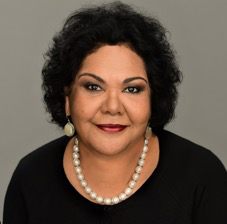 In April 2017, June Oscar AO became the first woman to be appointed as the Aboriginal and Torres Strait Islander Social Justice Commissioner at the Australian Human Rights Commission (AHRC). Commissioner Oscar has made the human rights of Aboriginal and Torres Strait Islander women and girls a priority of her term. It has been over thirty years since the Commonwealth Government invested in the landmark Women’s Business Report, which listened and responded to the needs of Aboriginal and Torres Strait Islander women. This year, 2018, the Department of the Prime Minister and Cabinet are supporting Commissioner Oscar and her team to build on the legacy of this report. The project called, Wiyi Yani U Thangani, Women’s Voices, will listen to the strengths, challenges and aspirations of Aboriginal and Torres Strait Islander women and girls in engagements across Australia. In her address, Commissioner Oscar highlights the remarkable lived reality of women and girls across the nation. She considers how gender equity will only be achieved when Australia delivers justice to First Nation’s women and girls. She explains how embedding human rights mechanisms in our policy and legislative frameworks will guarantee that we listen and respond to what Aboriginal and Torres Strait Islander women and girls need and want for a positive and healthy future. Through raising the collective voices of women and girls we can achieve a more just, dynamic and equitable nation. June has a Bachelor’s Degree in Business from the University of Notre Dame, Broome, Western Australia, and is currently writing her PhD. June is a co-founder of the Yiramalay Wesley Studio School and is a Community member of the Fitzroy Valley Futures Governing Committee. In February 2017, she was awarded an honorary doctorate from Edith Cowan University. Join us in the University Club Cafe after the lecture, where you will be able to purchase refreshments and continue the discussion. This annual lecture commemorates the life and achievements of Grace Vaughan, a social worker, social activist and parliamentarian, who was dedicated to the improvement of life at all levels and had a deep commitment to Australia's participation in the Asian region and to ensuring women's full participation in society. The lecture is presented by the Australian Association of Social Workers, the Institute of Advanced Studies at The University of Western Australia and Department of Communities Western Australia.